Offering you a complete choice of products which include powder filling machine, volumetric cup filler, weighmetric filling machine, vertical pouch sealer with loadcell weigher, shrink wrap tunnel packaging machine and controlled weigh filler. 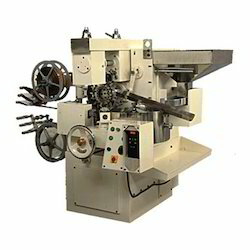 We have cut a specialty amongst the clients for offering heft of Powder Filling Machine. 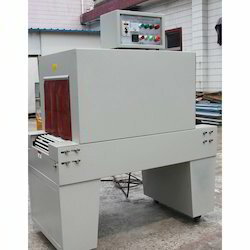 This Powder Filling Machine is broadly utilized for filling the powder legitimately in parcels and diverse sorts of bundling material. We keep the different requests of the customers in our psyche while building up the reach. 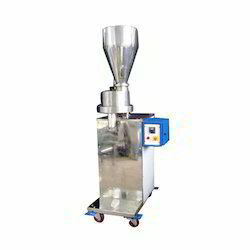 Grace Food Processing & packaging Machinery offers filling machine to fill Powder & semi powder as Spice powder, Milk powder, Chemicals, Pesticides, Food powder, Energy drink, Turmeric powder, Soap powder, Custard powder, Clay powder, Fertilizers etc. Volume Control by servo Motor / Clutch Brake. Adjustable filling unit for different volumes. Volume Control by Servo motor / Clutch-brake. Separate geared motor for stirrer. Filling Range: upto 10 Kgs. (By different model & Size of Screws). Power Required: Three Phase, 440V AC. 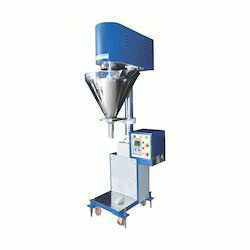 Optional Attachments: Screw feeder for feeding material in main Hopper. With earnest aims to save and inspire our notoriety in the business sector, we are putting forth an extensive variety of Volumetric Cup Filler. Our offered item is made in a manner that we can keep up universally acknowledged models. Attributable to their wonderful elements, these items are generally requested in the business sector. Furthermore, customers can benefit the offered range from us in an extensive variety of details. 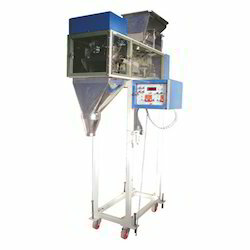 Volumetric Filler to fill free flow materials such as pulses, rice, tea, tobacoo, salt, Namkeen, Sugar, Pesticides, Spices, Snack feed etc. Power required: Single phase, 220V AC, 1 kw. 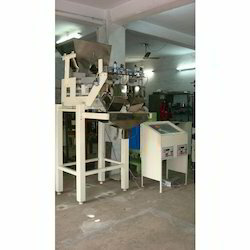 Reckoned as an eminent business organization, we are actively betrothed in delivering to our customers a wide array of Weighmetric Filling Machine. Accessible in accordance with the demands, these are designed in complete conformity to the market defined developments taking place in the nation. Additionally, our patrons can purchase these as per their needs. Big hopper for large product volume. All contact parts made stainless steel. Digital display for weight settings. Bulk & fine feeding by different modes. Power : 2.5Kw & 3 Phases. Speed : As per product weight. Air consumption : 2-3 CFM at 6 Bars pressure. Packing material Pouch, jute bag, jar, paper bag, valvebag. 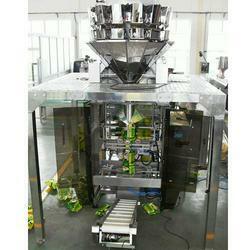 It is a Electronic Load Cell based weigh metric filler for Free Flow granules to get more accuracy in weight. Suitable to weight & fill the materials as Tea, Tobacco, Pulses, Rice, Dry Fruit, Snack Foods, Kurkure type Snacks, Chips, Biscuits, Cornflakes, Wheatflakes etc. 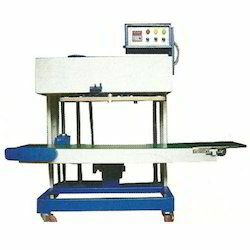 Linear vibrators are used for feeding the materials. 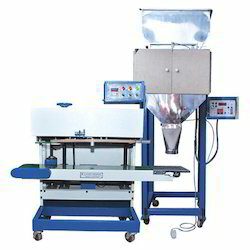 Filling Speed: upto 15 Fillings Per Min (By single head weigher). Compressed air: 4-6 kg/cm2 is required. Online UPS is required for accurate voltage and frequency. Power required - Single phase, 220 V AC, 3 kW. Shrink wrap on Corrugated Boxes, Bottles, Master Cartons, Solid objects etc. Suitable to weight & fill the materials as Tea, Tobacco, Frye Pulses, Dry Fruits, Snack Foods, Kurkure type Snacks, Chips, Namkeen, Bhujia, Biscuits, Cornflakes, Wheatflakes etc. All contact parts are made of stainless steel 304. 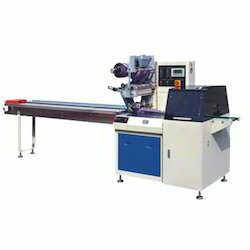 This is a sealing machine to seal preformed pouches made of laminated film as well as LDPE. Pouch will move in vertical position. Adjustable pouch conveyor for different pouch length from 5" to 40" (By different models). Main Motor - 0.25 / 0.5 H.P. Single Phase 220V AC. Different filling systems can be attached with this machine. Power required - Single phase, 20V AC 50-60 Hz, 2 kW. 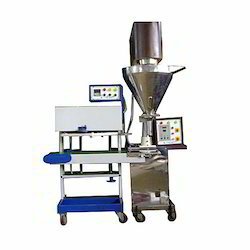 It is a volumetric filler to fill free flow Granules & Powders. Suitable to weight & fill the materials as Tea, Tobacco, Pulses, Rice, Snack Foods, Namkeens, Salt, Spices, Pesticides, Fertilizers etc. Continuous / Intermittent type moving disc. Filling Speed: upto 15 Fillings Per Min. 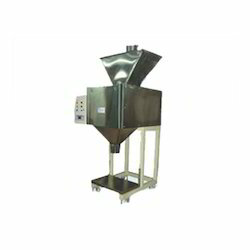 Suitable to fill cashew nuts, dry fruits, grains, rice, pulses etc. In pre-made pouches. Speed - 20 to 25 pouches per minute. 2 HP A.C. or D.C. Note: The above specification can be change by the supplier, above data are only indicative. Drive 2 HP A.C. or D.C. Cookies, Biscuits, Chocolates, Hardware equipments, Soap bar, long Vermicilli, Toys, Syringes, Medical equipments, automobiles equipment etc.